Our favourite slots-specific casino, SlotsMillion.com has recently launched their very own real money virtual reality casino and to celebrate they are offering players the chance to win 10 Oculus Rift headsets, set to be released in the first quarter of 2016. All you have to do to be one of the 10 lucky winners is wager $100 on any game at Slots Million to receive a ticket into the draw. You can earn as many tickets as you wish, and obviously the more you earn the more likely you are to win. Virtual reality gaming is real life simulated by computers to create an immersive experience so you feel literally like you are at the casino. 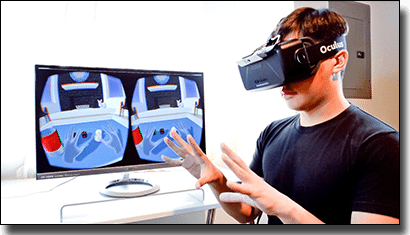 You need a headset to experience it, specifically an Oculus Rift headset for SlotsMillion VR casino, and it has been suggested this is the device pioneering the future of online virtual reality gaming. You will see on the SlotsMillion homepage that there is a link to their virtual reality casino where you can view what you will see when you put the Oculus Rift headset on. You will be able to enter SlotsMillion walk up to their array of slots (over 900 available) and then play the slots as you would if you were at a land-based casino. Check out our dedicated virtual reality gaming casinos page for more detailed information on how VR works. SlotsMillion has seen an array of new additions to their catalogue over the past two weeks from NetEnt, Microgaming, NextGen, iSoftBet, and Play’n Go. The slots are in order from most recently released. If you aren’t a member of Slots Million Casino yet, simply click or tap on our links to be taken to the site, and here you can register an account and take advantage of the $100 matched deposit, along with 100 free spins.